Note: This version is for Corel draw version X6 Only! It will not work on any other version. NOTE: This macro is a separate macro from GDG Color Click Basic but has very similar features. 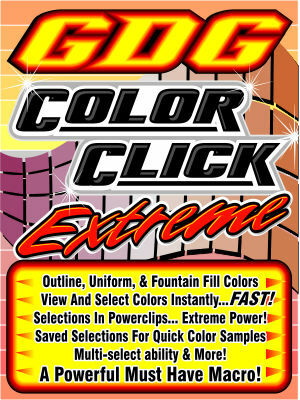 New features include: selection group sample presets, ability to sample colors inside powerclips, ability to make extremely complex selections of items on the page, and multiple color selection mode. It is non-upgradable from GDG Color Click version 1.0 or 2.0. If you do not need these features and already have GDG Color Click version 1 or 2 then you need not purchase the macro. Macro will only work in X6.